Risk Management is something that we deal with on a daily basis. This is not to say that we deal with high risk adventures, but we do want to be able to provide a positive and memorable experience. 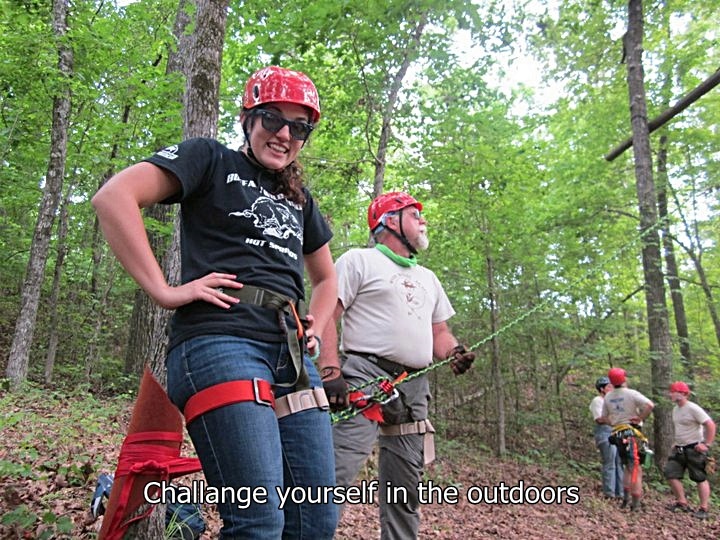 There is a lot that goes into managing for risks for an outdoor adventure. For example we constantly watch the weather before any trip starts. This is to make sure that we don’t have any high winds to deal with and to keep an eye out for scatter thunderstorms too. Here in the Wilmington area scattered thunderstorms happen a lot all throughout the summer season. 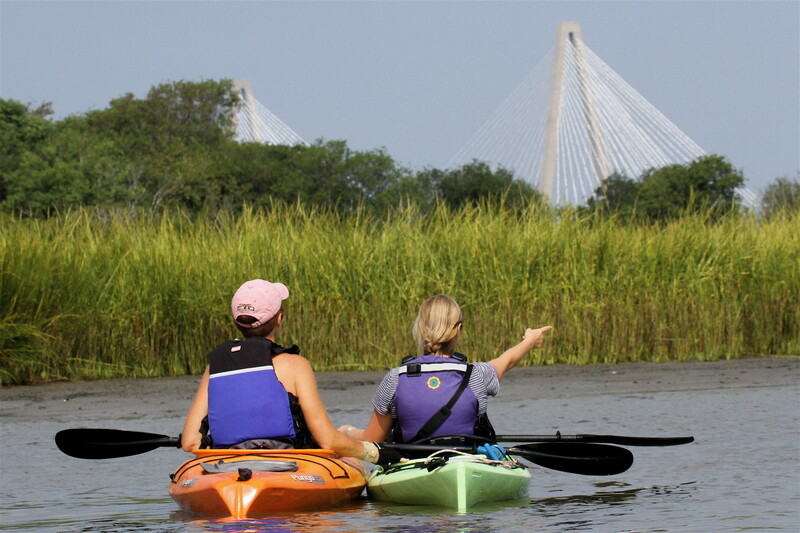 Another safety concern that we monitor during many of our kayaking trips is boat traffic, and container ships that travel along the Cape Fear River. These ships can create large wakes which become hazardous in shallow water areas. We also carry rescue gear in our guide boats on every trip in case someone does fall out of their boat. This is so that we can safely get someone back inside a boat if they do fall out. Along with our rescue gear, we also bring a large first aid kits on each trip. This past Thursday I had the opportunity to go to BSA Cape Fear Council’s Camp Bowers with Don to learn about the high ropes course, climbing tower, and zip-line that is part of the C.O.P.E. course there. The risk management that goes into operating these aspects is serious. Risk management starts before the course ever opens by having trained a professional such as Don inspect all the equipment, including different carabiners, ropes, helmets, and harnesses before use to make sure that everything is working properly and efficiently. Once all the gear is inspected and cleared for use then Don can inspect the course for any damage and safety concerns. After he has inspected the course, and everything has checked out, Don then begins to set up the course to be able to have participants safely climb up to the top where they can begin the course and use the zipline. To set up the belay system which makes sure everyone can get up on the course safely, Don uses steel climbing carabiners, it is important to note that he is not using aluminum carabiners because aluminum carabineers would be damaged by the steel cables that are part of the course which the belay is anchored to. Once participants are on top, they then have a self-belaying system with two adjustable ropes with clips that attach to their harness. These tethers are then clipped into the steel cables for safety (called lifelines). These are used as a backup device in case anyone does slip or fall off of one of the obstacles. Even though it may seem as though there are many different risks to manage for, if done properly it makes any adventure operate safely and efficiently. This past Sunday I had the pleasure of helping Don guide a group of people to Sharks Tooth Island on the Cape Fear River where we hunted for prehistoric sharks teeth and fossils. Around mid-morning everyone had found their fair share of sharks teeth and fossilized shells on the island and were ready to get back on the water to do some more paddling. It was at this time that Don and I had noticed a fairly large container ship easing its way up the river towards the port, so we decided to stay on the island and let the ship pass by before returning to our kayaks and continuing the adventure. We chose to stay on the island because these container ships are known for having big wakes, especially while traveling in a river such as the Cape Fear. 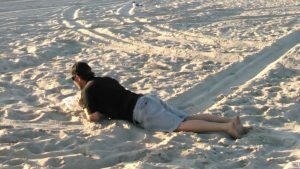 The areas where this is most prominently noticed are in shallow water. Because just like any wave, the wake from these ships doesn’t start to break until it finds shallow water. This is especially important to know while paddling because when the wake from those ships hit shallow water and start to break, it can provide an authentic whitewater experience here on the coast. And if you find yourself paddling through shallow water when this happens, you will most likely get flipped out of your boat. So as the ship passed by, we gathered our group on the side of Sharks Tooth Island that faces Kegg Island, watching the wake from the container ship crash into the shallow water around the island. After we had watched the wake stop crashing in the shallow water between the islands we then headed back to our kayaks to continue our adventure. It was at this time, we noticed a fisherman who was fishing on the opposite side of Sharks Tooth Island in a small john boat had been capsized by the wake. From the position we were at, we noticed the man didn’t have a PFD in sight, his boat was completely swamped, and he was having trouble swimming. So, Don and I immediately began our rescue procedures by jumping in our boats and getting to the man as quickly as possible to save him from drowning. Once we were able to get the man safely to shore, we then recovered his gear that was floating away and fortunately we had additional help to recover his boat and paddle as well. This situation goes to show that if you are out paddling, or on any outdoor adventure, without a trained professional, that being aware of your surroundings can help you better manage for any possible risks and it could possibly save your life. It is also a great example of why you should always wear a life jacket while paddling on the water. Because if you paddle enough, it’s not a matter of “if” but a matter of when you are going to fall out of your boat and go for a swim. I found myself at the boat ramp of the Fort Fisher Basin. It was the summer solstice, the longest day of the year. It was also going to be a full strawberry moon that evening, an anomaly which won’t happen again for over 50 years. Along with Don and I was Mahanaim’s environmental education expert, Mandy Uticone. Our customers that evening were with the Wilmington Parks and Recreation Department. 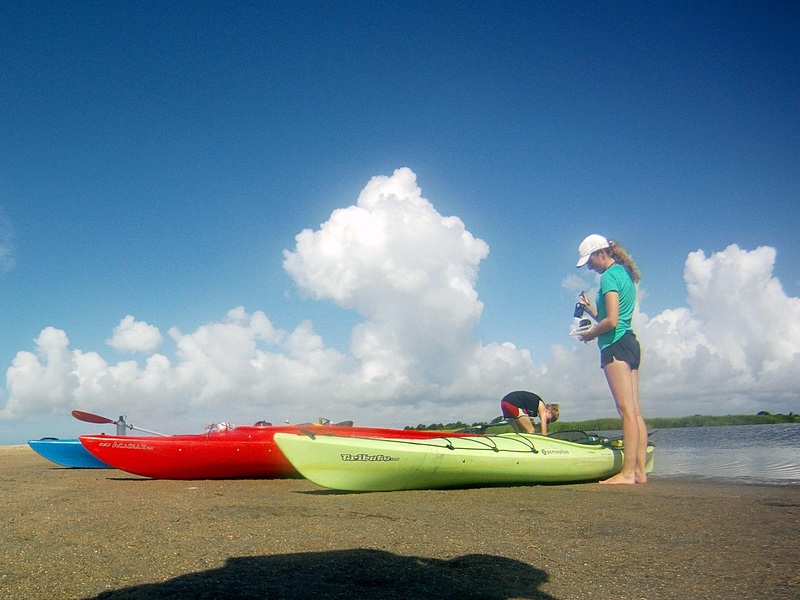 After a mile paddle along the Fort Fisher sea wall we landed at Zeke’s Island. Don explained the history and use of the island in addition to its estuary purposes. As our break ended we began paddling the second leg to a beach access were we ate our sack dinners. Just over the sand dunes was a newly laid Leatherback turtle nest. The nest was found that morning, marked, and roped off for its protection. Mandy taught us all about sea turtles that frequent the North Carolina shores and how they nest. During the lesson I helped Mandy by reenacting how a turtle crawls from the ocean, lays their eggs, and buries them with their feet. As the sun began to set we returned to out boats for the final paddle back. Half way through the paddle the sun was setting to the west as the moon rose to the east, a perfect ending to a perfect evening. 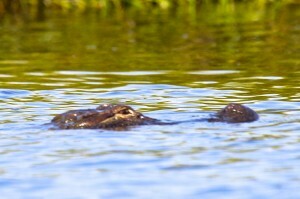 I am amazed at how fearful most people are of alligators that are found here in the Wilmington NC area. This is one of the most common questions I get when I am leading a kayaking adventure. Yes, we should have a healthy respect and view these wonderful creatures from a safe distance. However it amazed how the fear keeps some people from exploring the majesty of God’s Creation just because they may encounter one of these animals. As a boy growing up in gator country of central Florida, you learned to understand the amazing creatures. So, like any good Boy Scout here are some facts about alligators that my help you know more about this magnificent creature, and be prepared on what to expect when you see one. This alligator was seen at the southern tip of Keg Island in the Cape Fear River. The American Alligator is the most prevalent of the three species of crocodilians found in the US. The Gator’s range from North Carolina down to Florida and then around the Gulf Coast to Texas. There are very few American Crocodile and Caiman that can be found in the extreme southern part of Florida mainly in the southern portions of the Everglades. Gators live in freshwater wetlands and coastal brackish waters. Their diets mainly consist of fish, amphibians, reptiles, birds and mammals. They are more known for their savaging for food than hunting and attacking larger prey. Mating season beings in May as the spring warms up and the females will lay their eggs in June, with the eggs hatching in last July. Between 1948 – 2004 there were only 391 injuries and 18 deaths caused by alligators in the US. Alligators are active both day and night, but mainly feed at night and resting during the day light hours digesting their meal from the night before. Don’t let your pets swim in known waters where alligators live. The alligators will see the smaller pets at natural prey. Dispose of fish scraps in garbage cans and throwing fish remains in the water can attract alligators. Also, do not feed alligators. 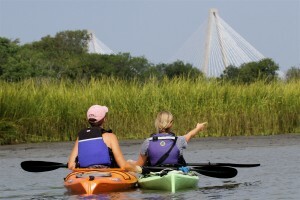 Posted in Adventure, Kayaking | Comments Off on Alligators! For those of you who grew up in Boy Scouts, you will know that the “Scout Motto” is to “Be Prepared“. This was drilled into me during my days as a scout and I can say, most great scout troops still place a great deal of emphasis on this. To be honest, one of the biggest things that gets to me is watching the vast majority of people take off with their kayaks are woefully unprepared for what they are fixing to do. This was brought home to me this past weekend when I saw a young couple jump out of their vehicles, toss their kayaks in the water and jump in and go! No PFD, no sunscreen, no WATER, no clue to the weather coming or going, much less of the river currents that will affect their paddle. When I pointed out the oyster beds they were fixing to walk into, they could care less (yes, they had no shoes of any kind on). I could only imagine that they had a less than pleasant time on the water. It is because of this lack of proper preparedness that I write the next blog. I hope over the next several weeks to add additional blogs that will help you be “Prepared” when you head out on your next adventure. Here are some very basic things that need to be considered before you take your next kayaking adventure. Always try to plan for the unexpected “what ifs?” What if I get delayed? Lost? Injured? Am I prepared to cope with that? Always have a map and compass with you. This means that you know how to orientate the map and use the compass, so make sure you learn basic map reading and compass navigation skills before you head out on the water. Pick a trip, even a short day paddle and study your intended route on a map at home. Doing this when you’re not stressed allows you time to become more familiar and comfortable with the unique markings of a topographic map and where you will be going. Float Plan. It is critical that you let someone know where you’re going, what route you plan to take and your estimated return time. If you get lost, the sooner a rescue operation begins the better for your searchers and you. If you change your plans before you start a trip, call and update someone, even if you simply leave a voice mail. This also implies that once on the river that you stick with your plan and not deviate. Oh, I am assuming that you will have your PFD with you before you get into the water. 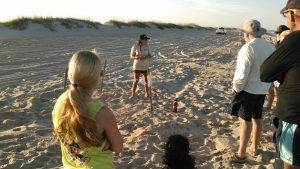 Mahanaim Adventures provide wonderful adventure in the Wilmington and Carolina Beach areas of North Carolina. We can also customize a guided kayaking adventure to Florida as well as any other location in the Southeast US. We specialize in creating that memory of a life time for you and your family and friends. Check out our web page and find out more details about all of our adventure locations. Team Building and Fear of the Unknown. Over this past year Mahanaim Adventures, had the opportunity to take several different groups on either a kayak or on a high ropes team building event. 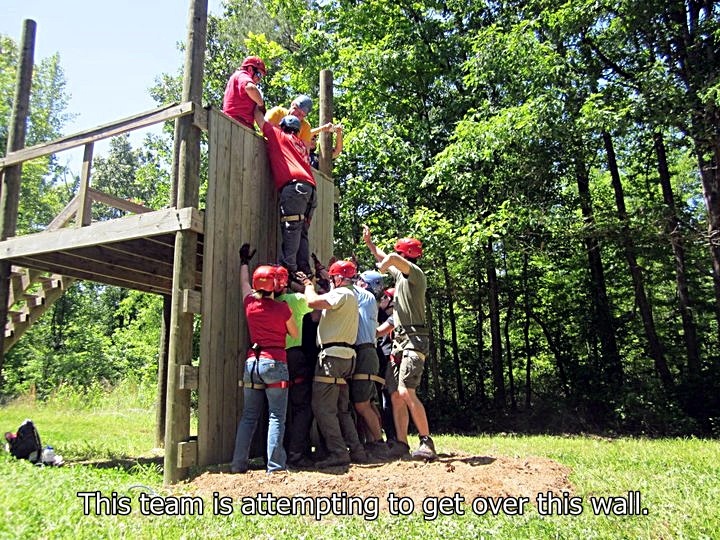 (The high ropes course is called COPE and the elements are the challenges on each COPE course) Our events are designed to challenge each person and group to learn new skilled needed in successful team work. As a COPE Course facilitator, one of the cool things I get to witness is how these folks with different prospective and backgrounds learn to come together as a team and solving some difficult challenges/elements. To see learning taking place while having fun is really cool. Our team building adventures, especially those that involve a COPE Course, challenges each person to learn new things but also to deal with known truth and overcome their fears. This is especially true when each group walk the COPE Course and see the elements of the course for the very first time. I have to admit myself that the first time saw the elements on my first course I was a bit scared. I remember that these elements looked like fun, but I began to think what had I gotten myself and those who worked for me into. 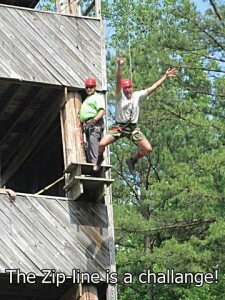 You see, I had planned a team building adventure for those who reported to me when I working at UNCW. At that time, our department had some radical changes forced on us and I really needed to challenge them to come together. I knew at the time it was going to be hard work to deal with these forced changes and I know we had to do this as a team and no one person could do this themselves. So I signed myself and my staff up for a COPE Course offered by the university. When we got there that morning, I had not realized that it would be so challenging and I would have to deal with my fear of heights. That morning I was forced to deal and act on what I knew to be true and to place my fear aside to help my team accomplish our goals. In other words, I had to put my faith in what I had learned and knew was truth into action. I was reminded that Faith is not faith at all, if that faith is not put into action. This is the same no matter who you are. You see, I had to act on what I knew to be TRUE and not let my feelings seize the moment. Once I did that, I not only was I able to help lead my team through some challenge events, but I also realized something else. That something else is what I call the excitement of real life. The fun of accomplishing something that earlier some of us had said, “Yea, right, I’m not doing that”. This was something that we had learned together. We learned that even though something may be hard and scary, we can act on what we know to be true and move forward. When we learn to do this, the challenge is still the same, but we learn we can overcome by working together, using each other strengths and having fun at the same time. We learned that stepping out in faith does not get any easier time goes by, because challenges are constantly being through at us in Life. Yet, those lessons learned on the high ropes course that morning helps each of us keep focusing on what is True and Right. Where are you being challenged at today? What Truth do you need to focus on so that you can take a step of faith and accomplish what scary challenge lies before you? 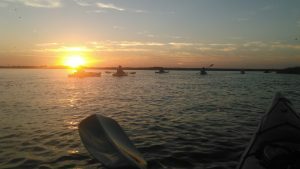 Posted in Adventure, Kayaking | Comments Off on Team Building and Fear of the Unknown. I often get asked about how I choose a paddle for kayaking or what the difference between this paddle and another paddle is. So, I figured that we would spend some time talking about paddles in this blog. When selecting a paddle, the most important thing to consider is the comfort of the paddle in your hands. The better paddles have an oval shaft that provide better control and comfort and will help you get the correct angel. A lot of kayakers have straight shafts paddles, but there are a few designs that are bent at the grips to ease the strain on the wrists. The length of the paddle will be determined by several factors like; type of water you will be paddling, the width of your kayak, you size and length of the blades on your paddle and your preference. The majority of the paddles we use with our tours are between 210 and 230 centimeters long. The general rule of thumb for choosing a paddle is to hold the paddle over your head horizontally. With your elbows at a 90 degree angle, you hands should be 6 to 8 inches from the blades of your paddle. Now for the blades of your paddle; if you have not noticed the blades of the paddle come in various designs. The larger the blade, the more power you will get out of your stroke; the smaller the blade, the less power per stroke and thereby more gentle to your arms and shoulder joints. Most blades are spooned for increase water resistance, helping with a more powerful stroke. Also, some blades are asymmetrical. This design is for balance of the force on the top and bottom of the blade when paddling and for angle placement in the water. One last thing about paddles, you have choice between a single and two piece paddles. I would recommend a two piece paddle. The reason or this is that you can choose the angle of your paddle with these paddles. For beginners, it is usually better to have your blades parallel with each other; then as you become for comfortable with kayaking you can then angle the paddle for feathering of your paddle in the water. Feathering is important for longer distance paddling, especially if you are paddling into the wind for long distances. Join Mahanaim Adventure for one of our upcoming kayaking adventures or why not schedule a private kayaking adventure for you and your family or friends. We even offer Team Building Kayaking Events.